Update: A lot of retailers have already announced their sales. See Myer, Target, BIG W, Harvey Norman, The Good Guys and JB Hi Fi. Boxing Day Sales are the biggest shopping event of the year in Australia and year 2018 is not going to be any different. This year’s in-store sales will begin in the early hours of 26th December 2018 at major shopping malls across all major Australian cities such as Sydney, Melbourne, Brisbane, Perth, Adelaide, and Canberra. Online sales start early, some starting even before the Christmas day. How to use this page? All Boxing day deals are being added to this page with featured deals right below this text and all other deals listed below with new deals listed on the top. Make sure to click next at the bottom of the page to see more deals. You can also see the popular deals on the right side of the page. You can bookmark this page (Press CTRL + D) and keep returning to it during the Boxing Day week. You can also check out popular deals page for deals listed by popularity. Boxing Day Edition @ Catch! Get Best Deals of the Year: Up to 72% Off 700+ Items. Items start from as low as $5.96. Boxing Day Sale 2018 is now on @ Pushys. Save Up to 80% Off over 5000+ Items. On sale items includes bikes, scooters, accessories, parts, wheels, tubes, clothing, running and lots more. Plus use the code: BOX10 to get extra $10 Off at checkout. The Skechers Boxing Day sale is still running. They have advertised savings of up to 50%, there are pairs here reduced by as much as 80% off regular price, so make sure you have a good dig around for those large discounts. 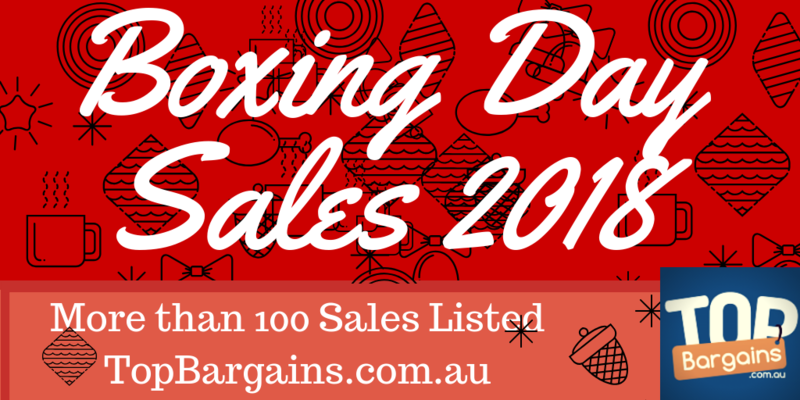 Kogan Boxing Day Sale 2018 is now on @ Kogan. Save Up to 95% Off RRP 3700+ Items. Discount prices are marked and start from as low as $4.95. Plus also get free shipping on lots of items. The stores are open now! Get Up to 80% Off Storewide. e.g. 1.98m Christmas Tree for only $9 (Was $39). You can find other trees starting from as low as $3. Check your local store for stock. Print and Present these latest coupons to redeem Boxing Day offers. ThinkPad Yoga 370 i7 13.3" FHD 8GB 256GB SSD Laptop for only $119 Delivered after code is applied at checkout. Starbuy Boxing Day Sale, e.g. Citizen Eco-Drive White 38mm Sapphire $99.00 Shipped. Massive clearance sale @ Foot Locker. Get Up to70% Off Entire Stock. On sale brands includes Adidas; Fila; Lacoste; New Balance; Nike; Puma and lots more. Just got myself Nike LA Lakers Kobe Authentic Jersey Home - Men Jerseys/Replicas for only $99.95, was $230. Qantas joins the Big Boxing Day sale this year. Australia Wide Sale is now on at Qantas. Travel periods are; Tue 30 Apr 2019–Wed 26 Jun 2019. Booking ends on Friday, 28th December 2018. Boxing Day Sale 2018 @ Glue Store! Save Up to 60% Off Storewide. On sale brands includes Adidas, Fila, Puma, Nike; Tommy Hilfiger, Champion and lots more. Standout offer in the sale is Adidas Unisex Classic EQT Backpack in Black for only $60, was $120. Boxing Day 2018 Savings @ PUMA! Get 40% Entire Stock Online. Discount prices are already marked and start from as low as $9. Just got myself TSUGI Cage Men's Shoes for only $85, was $120. Boxing Day Sale 2018 is now on @ Tiger Airways. Domestic flights start from as low as $39.95. Travel period is from 30th April to 19th July 2019. Booking ends on Sunday, 30th December 2018. Up to 85% Off Storewide in the Boxing Day Sale @ Peter's of Kensington. But if you browse you can through the website you can even find items discounted more than this. Massive Boxing Day Sale @ First Choice Liquor . Take 10% off your next experience purchase* at cudo.com.au when you use promo code "BOXINGDAY10". e.g. Taronga Zoo Annual Pass Package for $89.1, was $167. 15% Off Storewide in the Boxing Day Sale @ digiDIRECT. Discount is at time of purchase, while stocks last, no rollbacks or rainchecks. Ends Monday Dec 31 at 11:59 PM AEDT. f there ever was a time to shop online spontaneously, it's NOW! They already offering the very best wines at ridiculous prices, so imagine getting a further 10% off?! "They've gone bonkers for the plonkers," you might say. Say what you will, but Tthey are excited to give some extra jolly cheer this festive season on your plonk. But hurry! It's for TWO DAYS ONLY! Jetstar dropped its 2018 Boxing Day sale. You can now fly within Australia from just $37 or more. Travel period is from 29th January to 29th September 2019. Joyce Mayne - Boxing Day Sale 2018: Huge 1/2 Yearly Clearance - Fuji Instax Share SP-2 Smartphone Printer $98 (Was $299); Dyson V7 Cord-Free Vacuum Cleaner $299 (Was $599) etc. Huge 1/2 Yearly Clearance has started online an hour ago and will start in-store on Wednesday, 26th December 2018. The Boxing Day sale has just started. Save Up to 80% Off on 1000's of items. Discount prices are already marked and start from as low as $1.